Lilacs are one of the most wonderful parts of spring. And yet, they are also so very fleeting. 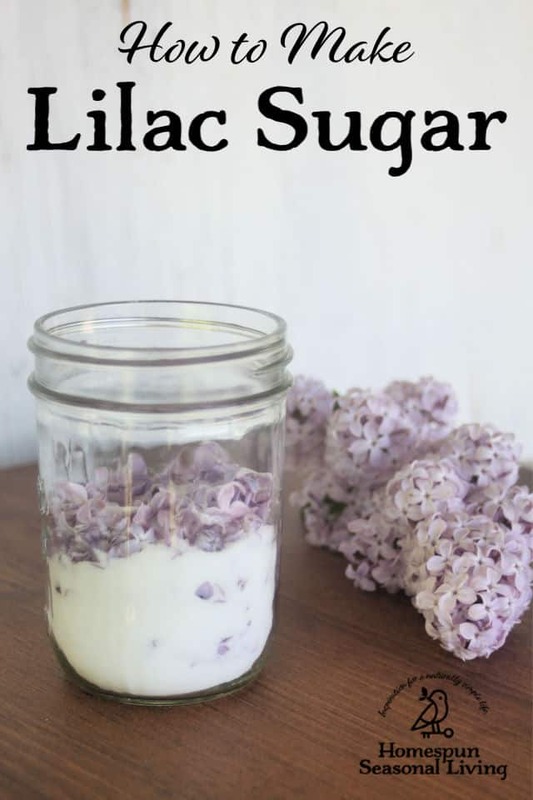 Make lilac sugar as a way to save them for the entire year. This truly is as simple as laying sugar and lilac blossoms in a jar and letting it sit. It's not a complicated project and yet is so very glorious. The stems and leaves of lilacs tend to be tough and bitter. Use only the blossoms to make lilac sugar. To do this, simply clip the blossoms from the stems with a pair of scissors. I simply do this standing over a bowl to catch the falling blossoms. Admittedly this takes a little time but it's not hard or drudgery by any means. Do it outside on the porch and listen to the birds sing for an especially pleasant seasonal activity. After clipping, do give the blossoms a quick rinse and spin through the salad spinner. This will remove and dirt bugs. Let them sit on a towel for an hour to remove any surface water before proceeding. Shake the jar of sugar every day for a week. Every day. 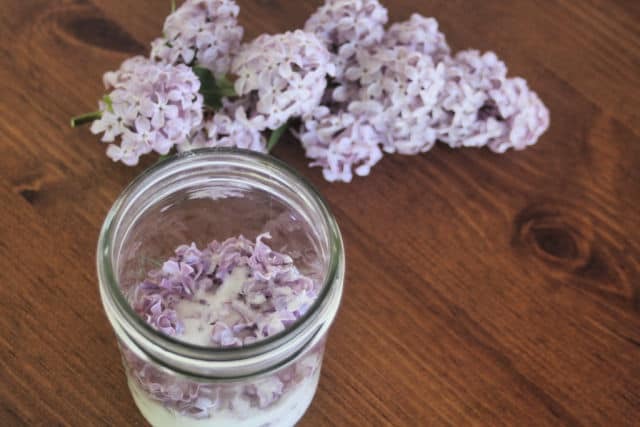 Skipping this means that the jar of sugar will likely become one solid mass as the sugar pulls the moisture from the lilac blossoms and hardens. After the blossoms dry (usually 7 days at most), they are essentially preserved, candied. One could strain those bits of flowers from the sugar by pressing it all through a fine mesh sieve. Or one could leave the blossoms in the sugar for a fun bit of color in baked goods. Perhaps make a jar of each – strained and with flowers. Use the strained sugar for drinks, the flowered sugar for baked goods. In short, use lilac sugar anywhere you'd use plain sugar for a light lilac flavor. Simply replace granulated sugar with lilac sugar at a 1:1 ratio in baked goods like cookies or cakes. Don't forget to add it to pancakes or waffles for a floral breakfast. 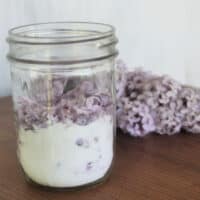 Sprinkle the lilac sugar and bits of sugared and dehydrated lilac blossoms on the tops of cookies or muffins for a floral infused sweet crunch. Use a little of it to sweeten tea for a floral flavor that is sure to delight. Make lilac hot cocoa by using lilac sugar instead of plain. Trust me, this is such a delight on a winter night. Dissolve the sugar in hot water for a simple syrup to flavor cocktails and mocktails. Sugar lasts a long time. Which means this can easily make for a great gift. 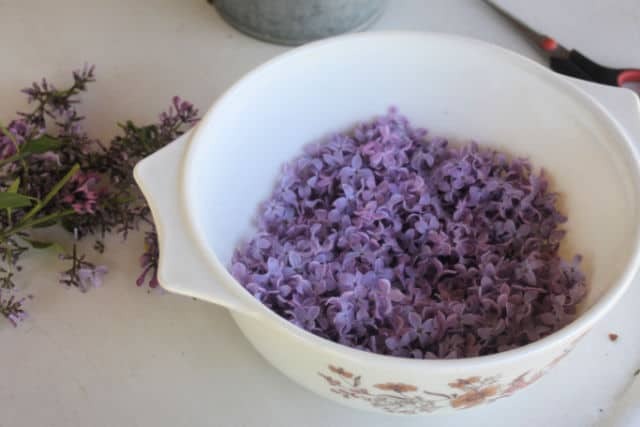 Make a big batch of lilac sugar this spring. Then divide it all into smaller, decorative jars and give it away during the holidays or for birthdays all year long. 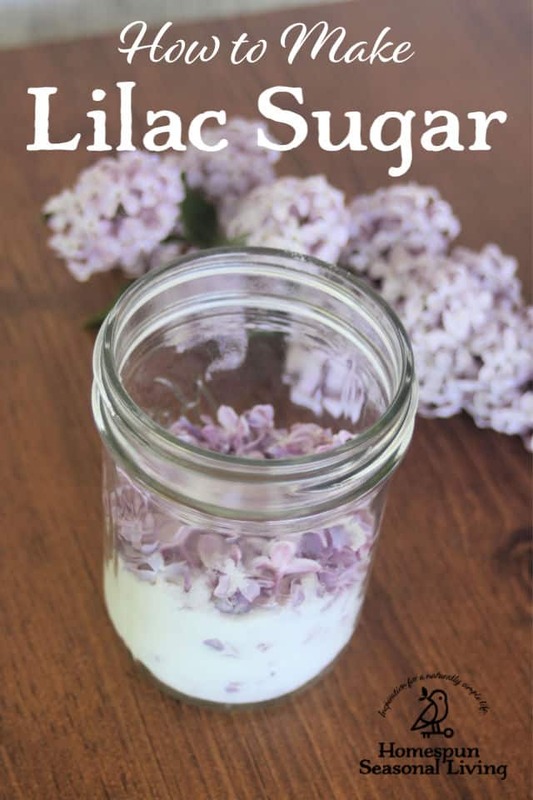 Make lilac sugar for a floral infused sweetener to add to drinks, baked goods, and more. Put a couple of tablespoons of sugar in the bottom of a jar. 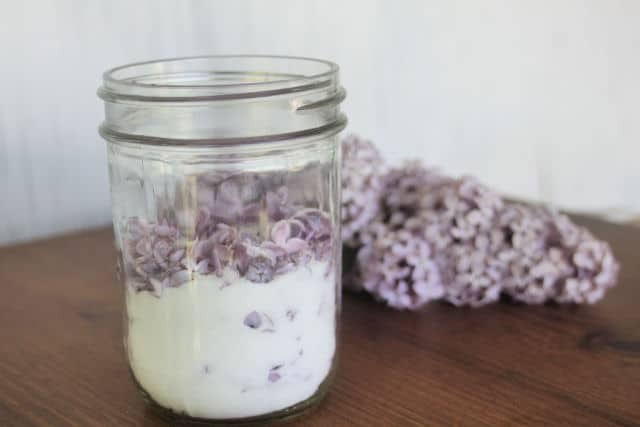 Layer a tablespoon of lilac blossoms on top of the sugar. Repeat the layers, ending with sugar as the top layer. Put a lid on the jar and shake the contents. Shake the jar every day for a week. At the end of the week the flowers should be dried and the sugar infused. Strain the blossoms from the sugar if desired. We try our best but cannot guarantee that nutrition information is 100% accurate. Want more ideas for eating lilacs? Hi Kathy! Lilacs are a favorite spring flower of mine, though we won’t have them out until mid-May in the Northeast. It’s such a brief season, I’m happy to capture their lovely fragrance with this great idea! Quick question, do you wash the lilacs first? (Assuming that’s a given.. :) Thanks! I would yes wash them. Wash them and give them a spin in the salad spinner. Make sure they’re pretty dry before putting them in the sugar. I’ll update the instructions to say that, thanks for catching my omission.